Hello and welcome to the MFT Wednesday Sketch challenge. This weeks sketch includes a fun grouping of strips in the center with an area for a sentiment. I love sketches like this that work so well for clean and simple designs. For my card I cut out three strips from white cardstock using one of the Stitched Fishtail Flag STAX dies. I then adhered them all side by side with temporary adhesive so I could cut off the ends with a Stitched Rectangle STAX die to make them all evenly sized rectangles. Once I had the ends trimmed off, I removed the temporary adhesive from the strips, took them apart and added distress inks to each of them using an ink blending tool. Once I had them all inked, I added water droplets over top to make them look distressed. I adhered all of the strips to a white cardstock panel and then I added a Stitched Fishtail Flag cut from vellum for the sentiment to go on. 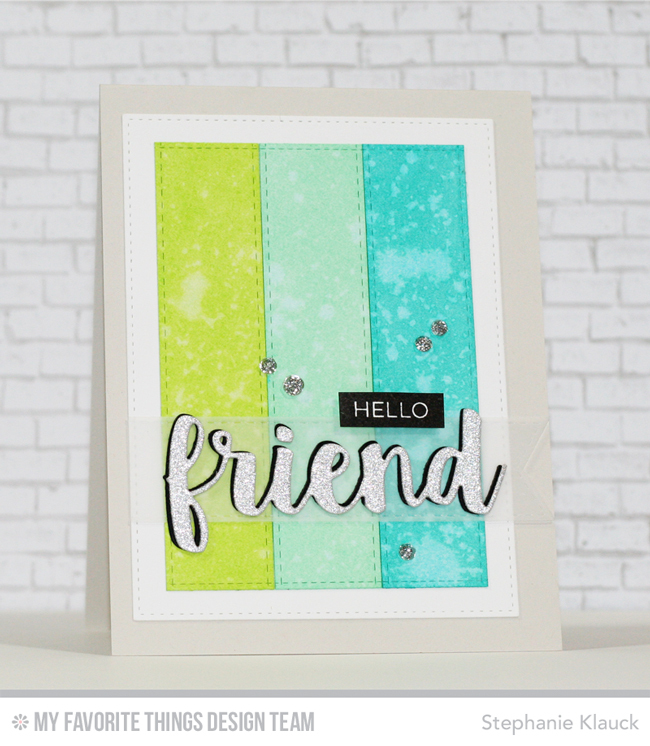 I diecut the word friend from silver sparkle cardstock and black cardstock and adhered them together creating the look of a shadow behind the word. I stamped the hello word using black ink, trimmed it out with my scissors and adhered it above the word friend to complete the sentiment. I finished the card by adding some clear sequins and then I adhered the panel to a top-folding Grout Gray card base. Love this! So pretty and easy to change up the colors. Your cards are so lovely. I like the simplicity of the design and the vibrant colours you choose to use.